The right monitor supports can help you swing into action. 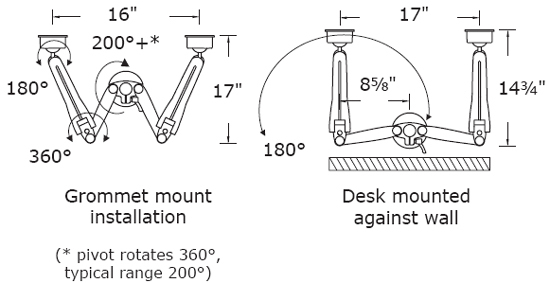 Optimizing the viewing angle, focal length and monitor height with a few simple twists and turns, WorkRite’s SwingArm articulates to virtually any position. 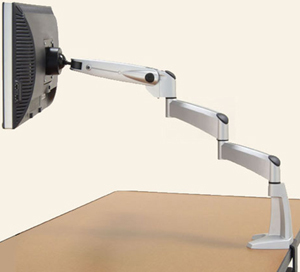 Create a Healthier, Safer, More Comfortable Work Environment - SwingArm allows users to easily adjust monitor height, focal distance and tilt angle. Stores easily to the rear of the work surface. Widest Range of Adjustments for Excellent Flexibility - SwingArm's height range is best-in-class at 21.5". Also leads in reach adjustability and supports monitors up to 25 lbs. Ball swivel allows users to easily set viewing angle and monitor rotation. Works with Most Flat Panel Monitors - If your monitor is equipped with an industry-standard VESA 75mm or 100mm mount, the SwingArm quickly attaches. You'll see and feel the benefits of the SwingArm's durable, stylish design. With a 360° rotation, monitor can be changed quickly from landscape to portrait orientation. For customized control, including touch screen use, tension is adjustable at all pivot points. All SwingArm products support monitors up to 25 lbs. For security, monitors attach with 4 screws.